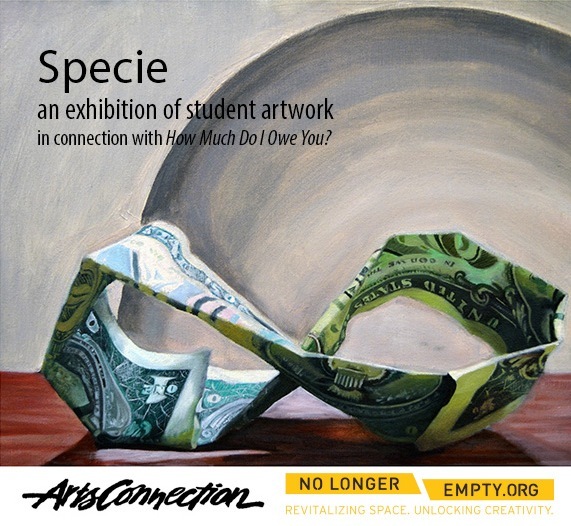 Teen curators from Teens Curate Teens present “Specie”, an exhibition of teen artworks on exchange, value and money. Teens Curate Teens is a new teen curatorial training program created by No Longer Empty and ArtsConnection. Student curators work closely with the No Longer Empty and ArtsConnection teams to curate and produce their own exhibition within “How Much Do I Owe You?”. The student artwork is chosen through submissions from ArtConnection’s Student Art Program, which has partnered with a number of high schools, including a few in Long Island City. The work of ten to fifteen student artists will be exhibited, reflecting on themes of currency, value and exchange from the perspectives of high school teens. NLE Curator Manon Slome is working closely with the curators, training them in public curation and art selecting; Project Manager Charlotte Caldwell has spoken with them about installation and art handling; Program Director Jodie Dinapoli will guide them in outreach, community engagement and programming. The show will be on view during How Much Do I Owe You’s normal exhibition hours: Dec 12 – March 13, Thursday-Monday, 1-7pm. Curatorial Team: Jessica Bain– Midwood High School, Maya Fell– Birch Wathen Lenox School, Ralphie Irizarry III– School of the Future, Stephenie Nan– Brooklyn Technical High School, Ada Wolin– Bard high School Early College and Margot Yale– Stuyvesant High School.